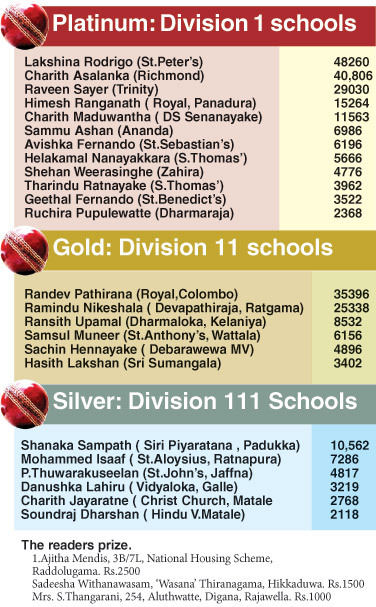 Peterite Lakshina Rodrigo kept his lead polling 48,260 votes to Richmonds Charith Asalanka ( 40,806) at the end of the 18th week count in the Sunday Observer/Mobitel Most Popular Schoolboy Cricketer Of The Year 2015. Being the final stages of the competition polling has been pretty heavy in all categories. Randev Pathirana of Royal College, Colombo maintained his lead in the Gold segment over Ramindu Nikeshala of Devapathiraja MV, Ratgama and Shanaka Sampath of Siri Piyaratna was placed first in the silver category.